Whether mud, gravel or snow, PRINOTH tracked utility vehicles are reliable tools for extreme use in extreme environments. Thanks to their huge payload, the vehicles can be equipped with specialised attachments of all kinds and are thus suitable for all construction, mining and drilling operations. PRINOTH’s tracked utility vehicles exert very little pressure on the ground, which is why they can also be used in places where other wheeled vehicles would quickly get stuck. In addition to this, the vehicles are used to transport personnel, tools and other heavy equipment. 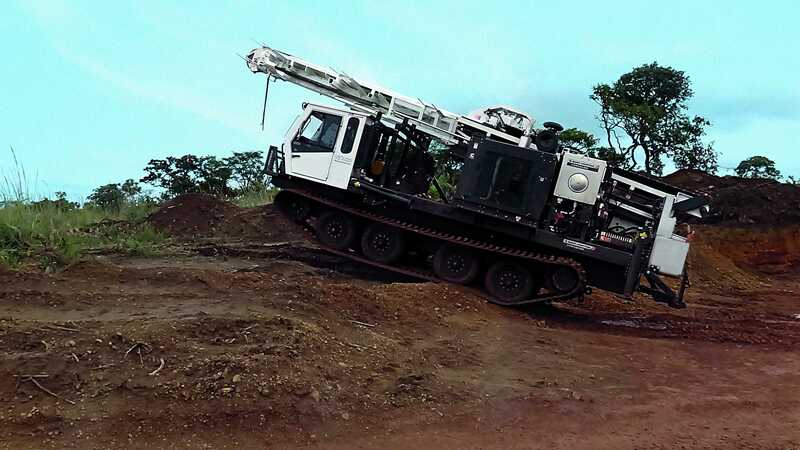 With its low ground pressure and all-weather capability, the tracked carrier Panther tracks the user into their construction or mining site anytime, anywhere. And once you are there, the Panther goes to work, employing its superior technology, numerous implements and raw muscle to get the job done. When it comes to exploration, excavation and extraction, the Panther is the ultimate choice when the going gets tough. You have a load of materials that have to get there and you do not have time to worry about it – no problem. With payloads reaching a maximum of 20,865kg (46,000lb), PRINOTH tracked vehicles have a dump box that will work for your needs. And with its low ground pressure and relentless reliability, the Panther gets your cargo to where it is going without fuss or mess. The Panther crawls you into sites other vehicles fear to tread, and once there, will drill its heart out for you. Seismic shot hole drills, soil sampling drills and exploratory drills are all possible with the Panther. Thanks to its 0° turning radius, navigating through narrow cutlines and seismic lines can be done safely and efficiently. Whatever terrain you have got to bore into, in temperatures as low as -40°C (-40°F) or as high as 51°C (124°F), the Panther can match it. Not only can the Panther crawler carrier work on the ground, but it can also take to the sky. Once its low ground pressure and wide track get you to your site, the Panther T8 can support a maximum payload of 7,260kg (16,000lb) and can be outfitted with a telescopic crane with a maximum reach of up to 18.9m (62ft). In addition to these features, the Panther’s innovative crane-chassis interlock safety feature ensures the task is completed safely. Getting things into the air begins on the ground. The tracked carrier Panther T8 has a ground pressure of only 155g/cm² (2.21psi). That means you can transport your articulated crane through some of nature’s toughest and nastiest terrain, set it up, and get to work. The Panther’s low ground pressure causes minimal disturbance to the terrain, but can equally dig deep and effectively when needed. Attach an excavator or backhoe, and digging in difficult terrains like swamps or hard packed surfaces becomes possible. The PRINOTH crawler carrier is a major liquid asset when you need to transport vital fluids to remote work areas over inhospitable terrain. With a maximum payload up to 20,865kg (46,000lb), the track machine is the perfect match. From supplying drinking water and drilling water, to refueling construction equipment and fighting fires, PRINOTH crawlers can get the job done, whatever the terrain. Having the right combination of wide track dimensions, low ground pressure and power means the Panther track carrier can take concrete to places other vehicles can’t. The Panther’s ability to tirelessly transport concrete back and forth to your worksite without getting bogged down saves you time and money. Why build an access road for wheeled vehicles when the Panther can track in and deliver its payload? Panther and concrete: a great mix. From the very beginning, PRINOTH has been a synonym for snow groomers of only the highest quality. The product portfolio was diversified in 2009 with the acquisition of Camoplast, a Canadian tracked utility vehicle manufacturer. Since then, PRINOTH has had the world’s most extensive range of tracked utility vehicles. By means of a strategic alliance with a German forestry machinery manufacturer, AHWI, the PRINOTH group has extended its activities to a third sphere of activity in 2011. In addition to the snow grooming and tracked utility vehicles sector, PRINOTH is now active in vegetation management and, besides the economically efficient working of forestry and agricultural land, is looking towards the global proliferation in biomass fuels. Interested? We’d like to provide you with more information. Please use the form below and send us your business enquiry.